Massachusetts State Senate President Karen Spilka speaks with Governor Charlie Baker in a newly refurbished Senate Chamber. Matt Murphy of State House News Service joins us for our quick look at the week ahead in politics and government. Sam Hudzik, NEPR: So Charlie Baker last week started his second term as governor, held some parties, gave a big speech. Did we learn anything about his priorities, and whether Democratic leaders in the legislature are willing to play ball? Matt Murphy, State House News Service: We did, actually. The governor — after taking his oath on Thursday — gave his second inaugural. It included some details of things we can look forward to, including in the near future. The governor said that when he files his budget, which will come later this month, he's going to put forward a plan to reform the formula that the state uses to fund public education, and to the cities and towns. 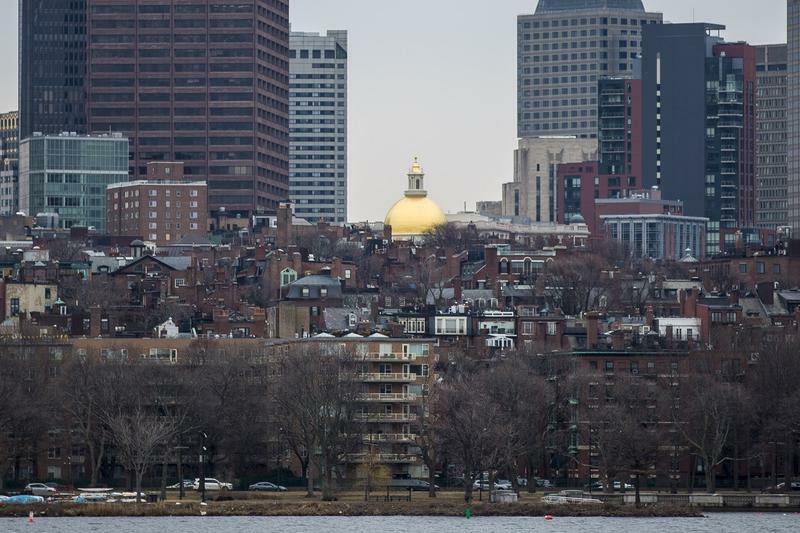 This has been a long-simmering issue on Beacon Hill. An attempt by the House and Senate last session to reform the so-called Chapter 70 funding formula fell apart in the final days of the session — in fact, final hours, actually, of the session. The governor was not really so much a part of that debate, and he seems to be ready to jump into the fray, and put forward a proposal. We don't know the magnitude of it, how much spending he's going to propose, or how and where that money will go, but something to look forward to. The other bill that fell apart at the end of the session in July was a health care bill that was intended to help community hospitals. The governor is signaling he is going to put forward a plan in the near future to address and help these community hospitals. So not a lot of details, not a lot of meat on those bones yet, but a skeleton of what to expect in the near future from the administration. And is there a thought that with Baker maybe being more involved this time around, on those issues, that it might actually end up passing? Yeah. Karen Spilka, the new Senate President, also gave a speech last week, in which these were some of her priorities, as well. She particularly singled out adequate funding for public education as a top priority of the Senate. Speaker [Robert] DeLeo typically waits and gives a preview of his agenda in a speech to the members a little later on in the year, sometimes in February. But there's no reason to think that he will not be at least supportive of the concept. It's in the details where these things usually get bogged down. Before they get on to any lawmaking, though, the legislature does have some housekeeping to tackle. I remember, a few years back, in coming up with the rules for how the House and Senate interacted with each other -- that was a major obstacle to getting started. Do you anticipate similar obstacles this time around? Not similar, but there's the potential for some controversy. We don't know yet how the new Democrats will react to the rules. A couple years ago, the House and Senate couldn't get on the same page. They actually ended up foregoing a rules agreement, and just operated the entire session under the previous session's rules, because they were at such a stalemate. The last session, back in 2017, they did strike a deal. But now we have 30 new lawmakers, including 25 in the House, some of whom went into the caucus where they elected Speaker Robert DeLeo last week, and tried to change the rules around how a Speaker was elected. They proposed a secret ballot, rather than a public ballot, to free up people who may be inclined to support a change in leadership, but are not necessarily willing to risk recriminations if they vote against the current leadership structure. So some of them have shown a willingness to put some ideas on the table, and we'll see as this rules debate unfolds, over the next few weeks, whether or not this is going to be a point of contention in the House. When lawmakers do start debating bills, the Senate is going to do so in a newly-decorated chamber — renovations that came with a big price tag, and kept the Senate working out of the basement the past couple of years, right? Yeah, they're back in the renovated chamber. This was a more-than-$22-million project. It wasn't just a cosmetic facelift, either. There were some serious structural issues in that chamber. We cover all of these sessions, and sit down there on the floor, and there were pieces of the ceiling, and the walls, kind of crumbling in the final days they were using it. They've been meeting down in the Gardner Auditorium in the basement of the Statehouse here for the past year and a half plus, and they finally on Wednesday moved back into the new chamber. It's nice. It's airy. They got rid of the blue color. It's a nice cream color now, and I think the senators are happy to be back in their chamber, and we're happier, because it gives us a little more access to them. Gov. 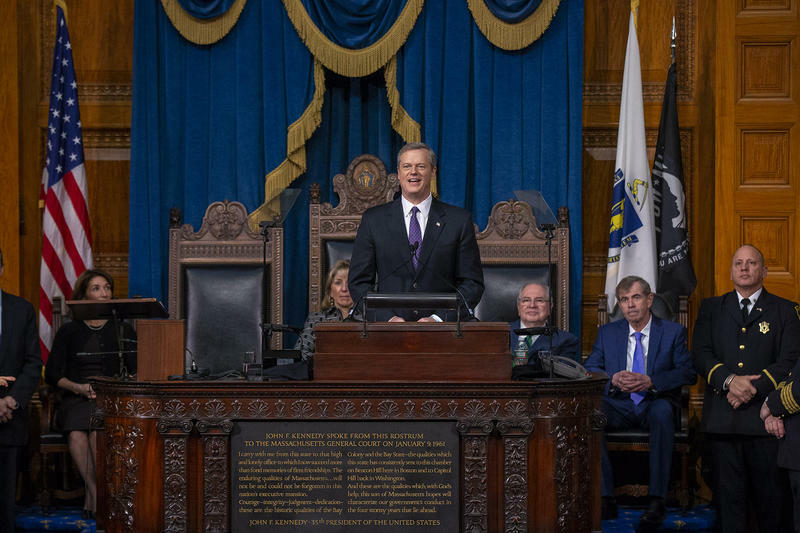 Charlie Baker is urging patience after being sworn in for his second term as the state’s chief executive. In his second inaugural address, on Thursday, the 62-year-old Baker spoke of unfinished work in education, transportation, housing and health care. Massachusetts state Senator Karen Spilka was elected to her first full term as Senate President on Wednesday, the third woman to wield the gavel in that historic body since 2007.